Sovereign 4 Column Cast Iron Radiators - 12 Sections - Full Polish and Lacquered. 480mm tall, 750mm wide. Cast Iron Radiators from our popular Sovereign 4 column series - this is 480mm or 18.8 inches high. This cast iron radiator was introduced during the late Victorian era and has remained popular. This traditional design is both a design classic and has a very high heat output. 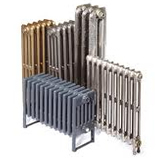 Full polished cast iron radiators are polished on all available surfaces. Our Lacquering process means that your cast iron radiators will not require any ongoing maintenance.